Are you ready for some fresh air? We are, too! Spring is here, and it’s time to open the windows and get a fresh start after a long winter. 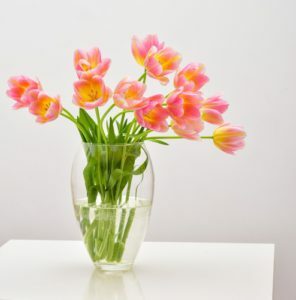 If you’re as eager as we are to welcome spring, here’s what you can do to get your home ready. There’s a reason everyone calls it “spring cleaning.” There’s no better time than spring to deep clean the house after it’s been shut tight for months. Vacuum rugs and upholstery, dust surfaces and clean windows. Give the kitchen and bathroom a thorough cleaning, dust ceiling fans and clean curtains and drapes. On a warm day, open the windows and let the house air out. Time to put those heavy blankets and velvet pillows away. A great way to get a dose of spring in your home is to update your couch and bed with lightweight pillows in cheerful colors. Swap out your winter bedspread for something lighter and brighter. Add in some color with accents like wall art and pretty vases, which you can fill with spring flowers you pick up at the market. Choose some new scented candles with light fragrances like lilac or gardenia to make your home smell fresh and of the season. Cleaning the gutters isn’t anybody’s favorite job, but it must be done. Spring is a great time to tackle this chore and remove the debris that has accumulated during fall and winter. Remove as much as you can with your hands (be sure to wear gloves) and then rinse with the garden hose. Make sure all the downspouts are free of obstructions so they can handle the spring rain that is on its way. The garage can take a beating during winter months. Open it up to let it air out and sweep out the garage floor. Throw away any junk that has accumulated and organize seasonal decorations if you haven’t already done so. Get bikes and sporting equipment ready for spring and while you’re at it, clean and wash the car. It’s time to get those decks and patios ready for barbecue season. Power wash decks, patios and walkways. Clean outdoor furniture and refresh them with a coat of paint. Clean or replace cushions. Prune perennials, shrubs and trees and mulch garden beds. Consider adding window boxes to your home or garage and fill them with pretty spring flowers. Hang a seasonal wreath on the front door and put out a new doormat. Nothing feels more like spring than newly blooming plants and flowers. Adding them to both the inside and outside of your house can really make it feel fresh and fun. Plant spring annuals in garden beds and add some in pots around the front door. Choose some new houseplants for the living room, bedrooms and even the bathroom. Interior plants not only make the house look pretty, but they also filter pollutants from the air and help keep it clean.